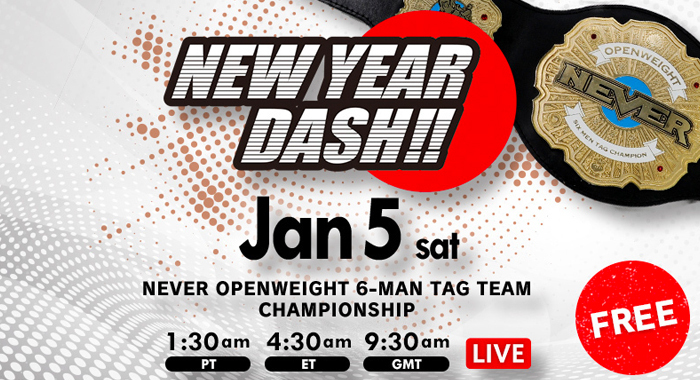 Los Angeles, CA – (January 31, 2019) – AXS TV continues its coverage of New Japan Pro Wrestling’s “New Year Dash!! 2019” with a second hour of strong style action premiering this Friday, Feb. 1 at 8pE/5pP. “The Rainmaker” Kazuchika Okada teams up with longtime rival Hiroshi Tanahashi and Chaos stablemate Yoshi-Hashi to take on his former mentor Gedo, Gedo’s new protégé Jay White and the Bullet Club’s Bad Luck Fale. Watch a first-look clip of their showdown here. Plus, the Guerillas of Destiny (Tama Tonga & Tanga Loa) and Taiji Ishimori defend the NEVER Openweight 6-Man Tag Team Title against Taguchi Japan’s Ryusuke Taguchi, Togi Makabe and Toru Yano; and Chase Owens and Yujiro Takahashi take on Tomaoki Honma and Toa Henare.